In March of 2015, PRISM was contacted to come back out and investigate their home in Omaha, NE. They continued to have issues in their home with paranormal activity with intensity. On March 27th, 2015, the PRISM Omaha team conducted a full overnight investigation at the home. Investigators present during the investigation included - Kelley K., Bo K., Michael B., Cassandra B., John P., Carrie L., Kerry J., Shannon T., Jeremy A., and Nichole C.
In October of 2014, PRISM was contacted by a couple in Omaha, NE asking for assistance with their home. They were experiencing poltergiest style activity where toys would be moved by themselves and mainly their sons Binkies were being moved to different locations. They also experienced talking and shadows as well. On October 21, 2014 PRISM conducted a pre-investigation of the home. Investigators present included - Kelley K., Bo K., Michael B., and Cassandra B. On November 14, 2014, the PRISM Omaha team conducted a full overnight investigation at the home. Investigators present during the investigation included - Kelley K., Bo K., Michael B., Cassandra B., John P., and Carrie L.
This is video compilation of the March investigation. 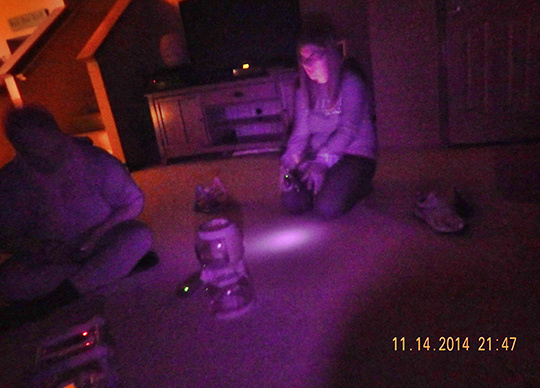 This EVP was captured at approx 8:30 PM on October 14, 2014 in the living room of a private residence in Omaha, NE. During the audio recording there is no one in this room of the house. We hear someone whisper "Listen" into the recorder. This EVP was captured at 8:50 PM on October 14, 2014. PRISM Investigators Cassandra Beacom and John Powers are the only people in the room. We cannot make out what the spirit is saying here. This EVP was recorded in the babies room at 11:05 PM on October 14, 2014. It sounds as though its saying "Get Up"